Thank you to Catherine Anderson, the creator of Parentinn.com for writing this guest post today. Catherine provides us some extremely easy and simple tips regarding potty training. Make sure to check out her website for effective baby sleeping tips and insightful parenting advice. 1. Asses Your Child’s and Your Own Readiness. Do not force potty training just because your neighbor’s child is already potty trained. The timeline for potty training is unique for each child and is different for boys and girls. Start potty training when you and your child are both ready and not for any other reason. There’s absolutely no need to push it if you are not a hundred percent ready. 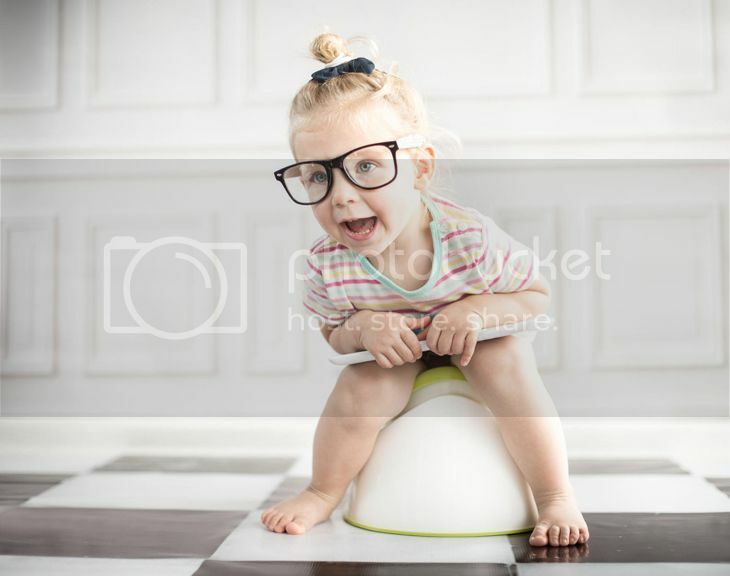 Trying to potty train too early or too late will only compromise your progress and result in a prolonged time table. Mental, physical and emotional preparedness is important! You probably want to watch out for signs like your child’s ability to walk, sit and stand or their ability to follow instructions. These signs should tell you that your child is ready. Once your child is ready, don’t jump into potty training just because they’re already there. Ensure that you are also a hundred percent ready because you are the trainer and your child will need you each step of the way. 2. Mentally Prepare Your Child For Potty Training. Gradually introduce the idea of potty training to your child. Constantly remind him/her that he/she is now a “big boy” or a “big girl” and that big kids do things a little differently and they are obedient. Visual is also important. When your child poops, show them how big the poop is. Use phrases like “your poop is getting too big for the diaper” or “soon you will try to poop in the potty”. You may also try laying low on the diapers and let your child wear undies from time to time, explaining that “big boys” or “big girls” wear undies instead of diapers. This way, your child will not be overwhelmed by sudden changes when you start potty training because subconsciously they were already expecting the change in their routine. 3. Buy a Potty Chair Or An Adapter Seat That Your Child Will Love! Take note, something “that your child will love”. This is important, remember that potty training may take up a lengthy period of time and throughout that time, their potty will be their best friend. Therefore it’s a good idea to include your child in deciding which potty or adapter seat will be perfect for them. Some kids tend to be scared of the appearance of the adult toilet. If your child is one of these kids, a special adapter seat would be a good idea to help them get acquainted with the adult toilet. But if this is too much for your child, there’s no rush in sitting them on the adult toilet. You can always get a cute potty chair that your child would find fun. 4. Plan a Routine For Your Child. Now that you have a potty chair, it’s time that you let your child get familiar with it. Starting with once a day, let your child sit on the potty chair, even with clothes on. This may be done after breakfast of after a nap. Once you have picked the right time for your child to sit on the potty, be consistent. Just let your child get comfortable with sitting on the potty chair. The goal is simply to let your child recognize the potty chair as a part of their daily routine. If you tried this with clothes on first, once your child is comfortable with the potty chair, gradually adjust to sitting them on the potty with a bare bottom. All children learn by copying. In this step, some families imply the “open door policy” at home. This means that whenever adults need to pee they leave the door open so that the toddler may see how girls and boys use the toilet. Naturally, the child will be curious and will ask questions. This then, gives the parents the opportunity to explain the difference between boys and girls when they use the toilet. Other families prefer the “one-on-one method” where if the child is a boy, daddy or any adult male figure would let him watch when he uses the toilet. On the other hand if the child is a girl, mommy or any adult female figure would let her watch when she uses the toilet. What’s important in this step is for the child to see how he/she is supposed to use potty. As mentioned earlier, the visuals are important. Children mirror what they see adults doing. And because of their curious nature, children are likely to try sitting on the potty chair on their own after seeing adults on the toilet. 6. Explain How To Go To The Potty. You have introduced the idea. You have bought the equipment. And you have demonstrated the procedure. Now is the time for you to explain what you have been doing all along. When your child poops, bring them to the toilet and drop the poop beneath while he is seated. Clean up and then flush the toilet. Some children will delight in flushing the toilet themselves and watching their poop go down. While others, those who are sensitive to change, will most likely be scared at first and just prefer to watch you do it. After doing this routine a couple of times, your child will understand that poop is supposed to go down the toilet. You may also want to reinforce your child’s understanding and recall of the potty process by using story books and posters about potty training. Through these your child may have a better understanding of why he/she needs to use the potty and memorizing the steps would definitely be easier if they are presented in a story or via pictures, as young kids are often visual learners. Now that your little one is familiar with the process of going to the potty, constant reminders and encouragements are necessary. As they say, the key is consistency. Remind your child to go to the potty every time he/she feels the need to go. And when your child goes to the potty, make sure to keep them company. This will help your child ease in to the process and it will keep them focused on the task at hand. Let your child sit on the potty for a few minutes. If you’re not lucky, it’s okay. Try again in 15 minutes or 30 minutes. Constantly asking your child if they need to go is another effective technique. During this stage, some parents let their children play with bare bottoms. Why? Because then they would be out of the diaper and there’s nothing to catch their pee or poop. Once they realize what a mess it makes, kids seek out the potty. However, this is not a one day process. If you decide to try this technique, be prepared to clean puddles of pee here and there. In the interest of reinforcing the habit of using the potty, make sure to shower your child with praises whenever they successfully use the potty or succeeds in having an “accident” free day. Simple rewards also work great with most kids. This can vary from small toys, story books, or art materials, whatever works for your child. When you do this, your child will feel that they did something great! The more positive reinforcement a child receives, the more likely it is for them to repeat the reinforced behavior. As your child goes through potty training, they will grow more and more independent. By now, your child can probably go to the potty with minimum assistance. Maybe you just need to constantly ask your child if they need to go, or maybe you need to help them pull down or pull up their pants. As long as they need your assistance at some point of the routine, then they are yet to be considered “potty trained”. Therefore, even if you have achieved a series of “accident” free days, they may still happen. And if they do happen, handle them with grace. Setbacks happen, remember, your child is learning a new skill set. Don’t scold your child for making a mess, instead acknowledge the parts of the routine that they did accomplish. For example, if your child’s playing when they felt the need to go and they did try to go to the potty but did not make it, acknowledge the fact that your child tried to go to the potty. This means that they remembered the routine, appreciate that. Use encouragements like, “It’s okay, next time we’ll walk faster to reach the potty”. It’s normal for children to wet their bed occasionally until they’re of school age. And so, it’s a good idea to continue letting your toddler wear diapers at night time. However, do keep your child’s potty chair near his/her bed. This way, just like with daytime potty training, you can constantly encourage your child that if he/she happens to wake up in the middle of the night and feels the need to go, he/she can call your attention and ask for assistance to use the potty. When you notice that your child can stay consistently dry at night, then you may try to do away with the diaper. But before you embark on diaper free nights there are a few things that you might want to consider. First on the list is protecting your mattress from possible “accidents”, a good hack for this dilemma would be to wrap the mattress with plastic before you put the bed sheet on. Once your bed is secured, it’s time to prepare your child for his/her diaper free night. To lessen the risk of bed wetting most parents lay off milk at least an hour before bedtime. Less fluids means less chance of needing to pee in the middle of the night. They also let their child use the toilet before bedtime and first thing in the morning. This technique works because instead of needing to wake up just to use the potty the child’s body is conditioned to release excess fluid before bedtime and upon waking up. This will work for the best, since your child has already mastered daytime potty use. Children usually master daytime potty training before they are ready to start night time potty training. Now, when can you say that your child is “completely potty trained”? You see, during potty training, a child constantly needs to be reminded to use the potty. When still training, the child needs company and hand over hand assistance every now and then. Once you are confident that your child can recognize when they need to use the potty without being reminded and that they can get the job done without any help whatsoever, regardless if it’s daytime or night time, congratulations! Your child can be considered “potty trained”. Exercises To Avoid While Pregnant.